I take pride in the hunting areas I am able to provide for you. Each represents a unique feature or region, and together they make for a most interesting safari across Namibia. Namibia is a stable, welcoming country that has won the Top Country award of Wanderlust Magazine readers in 2014 and 2019. Most hunts will include more than one of these areas. Depending on what species you are looking to hunt, you might start out in the west in the Spitzkoppe region, then move on to the central part of Namibia on a private hunting area. The Orange areas are communal conservancies. The Yellow areas are other private hunting areas. This is an excellent place to start your safari, and is 1 hour drive away from the airport in Windhoek. The best game here is black wildebeest, blue wildebeest, hartebeest, impala, warthog and blesbok. We hunt mostly the wildebeest and blesbuck because there are more of them. You have a better chance of getting a really good trophy. This is open, flat country with bush land and easy to walk. In the mountains on the west end of this area, there is a good chance to hunt mountain zebra. Most of the area does have a game fence, but it is such a large place that it is definitely a fair chase for the animals. More about the Farm Ruppell safari area. 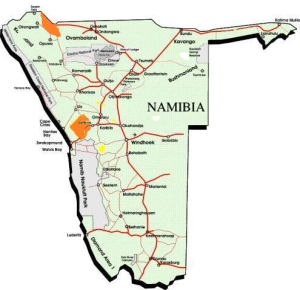 Most of the hunting is done in this area, approximately 2 and a half hours drive away from Windhoek toward the coast. It is a huge hunting conservancy, 2700 square miles, where all of the game is free-roaming. Across this distance, the landscape changes from dry with broken mountains to thorn bush land with plains. Despite the dry conditions, it makes it one of the better areas for kudu, oryx, hartebeest, steenbok, springbuck, mountain zebra, leopard and more. Also in this conservancy is a desert, part of the Namib Desert. It is wide open with grass plains and some mountains with dry river beds. The most common game is springbuck. There are also klipspringer, mountain zebra, kudu, steenbok, and leopard. More about the Spitzkoppe hunting area. My most exclusive area is in the far north of Namibia. Very few hunters each year are able to hunt here. The environment is slightly different, with sand and thick bush, good tracking experience for plains game. In this area, eland trophy hunt is a must. It is 37,100 acres large. The game includes eland, kudu, oryx, warthog, blue wildebeest, impala, giraffe, burchell zebra and hartebeest. There are also spotted hyaena, leopard and some cheetah. It is 5 and a half hour drive from Windhoek. That is a long drive if you want to go straight there, but we can always hunt a day or two at another hunting area along the way. You can also plan to stop off or drive through Etosha National Park which is on the way. More about the Kunene River hunting area. Also near the Etosha National Park I offer hunting. More about the Etosha hunting area.